This post is sponsored by Olive Oils from Spain. 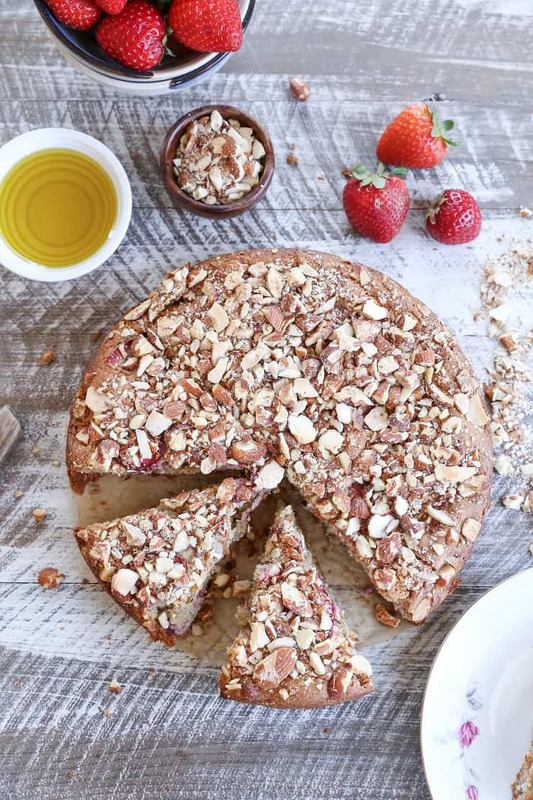 Grain-free, refined sugar-free, dairy-free strawberry breakfast cake made with almond flour, olive oil, and pure maple syrup. 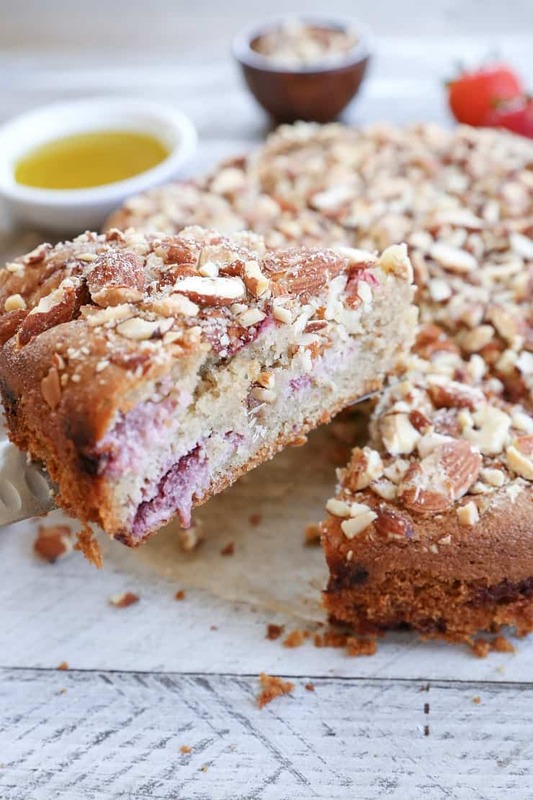 This protein-packed cake is healthy enough to call breakfast, and delicious enough to call dessert! While I typically live in Savory Breakfast Camp, I’ve been known to pound a slice of cake or two for the first meal of the day. 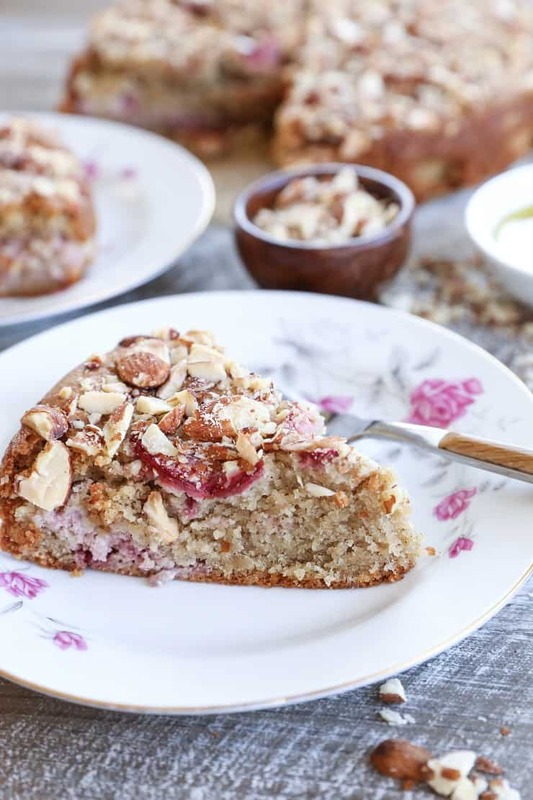 This particular dessert-for-breakfast adventure is packed with protein, and is grain-free, dairy-free, and refined sugar-free. Honestly, with features like these, eating cake for breakfast seems like a stellar life choice. 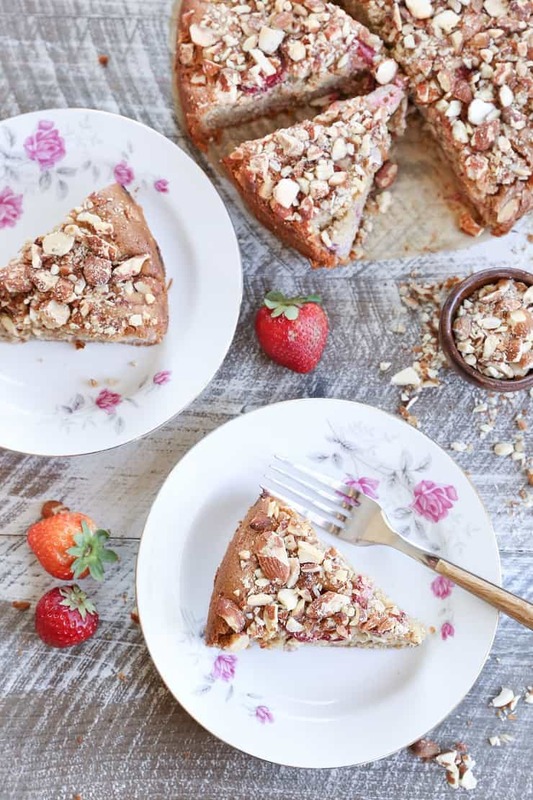 Made with almond flour, extra virgin olive oil from Spain, pure maple syrup, and fresh strawberries, this cake turns out perfectly moist, sweet, and flavorful while still being nutritious. That’s right! We’re using extra virgin olive oil from Spain for this beauty! Should we have words about it? I think so! Do you remember when olive oil cakes were a thing? I do. About 6-8-10 years ago, I saw recipes for olive oil cakes everywhere, and for a good reason: olive oil makes cakes (and breads, muffins, pancakes, etc) supremely moist and gives them a unique rustic flavor. As with most things in life, not all olive oils are created equally. I partnered with Olive Oils from Spain to bring you this post to provide information on the various types of olive oils Spain produces and to raise awareness of its versatility. Olive oil production in Spain has been a big deal for 2,000 years. Spain, in fact, produces 50% of the world’s olive oils! Extra virgin olive oil is my oil of choice for almost all my oil needs. It is incredibly versatile in both sweet and savory applications. I use it regularly for baking cakes and muffins, whipping up pancakes and crepes, and I cook with it each and every day. More often than not, I dress my salads with a simple drizzle of extra virgin olive oil and lemon juice, and I select it also when I make sauces, marinades, and salad dressings. While there’s been heated debate about the health benefits of oils in general lately, extra virgin olive oil is high in monounsaturated fat, antioxidants, and is a known anti-inflammatory. Extra virgin olive oil contains oleic acid which helps reduce the level of bad cholesterol and increase the level of good cholesterol. It also contains a high amount of Vitamin E, which helps prevent arteriosclerosis, and may reduce blood pressure. In this sense, it’s my fat source of choice in most applications that require it. The two most common types of olive oil are extra virgin olive oil and olive oil. These two oils are categorized by specific physical and chemical parameters, and relating to the way it’s processed. Extra virgin olive oil is a pure fresh olive juice, comes from the highest quality olives and meets the highest regulations, whereas olive oil shares the same high content of monounsaturated fatty acids, which are essential to a healthy diet, but are obtained from virgin olive oils that have not met the high standards required of extra virgin olive oils. Learn more about the various types of olive oils here. Okay, now let’s talk CAKE! I pulsed some raw almonds in my food processor and sprinkled them on top of the cake batter before baking so that they became nice and crunchy during the baking process. 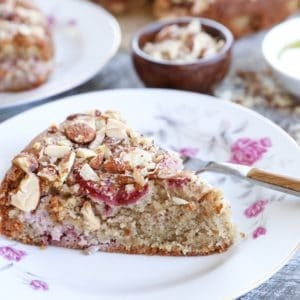 The soft cake with the crunchy almonds is very texturally pleasing! Olive oil cake for breakfast! Preheat the oven to 350 degrees F, and lightly oil or spray an 8-inch spring form pan (or regular 8-inch cake pan). Line the bottom of the pan with parchment paper. 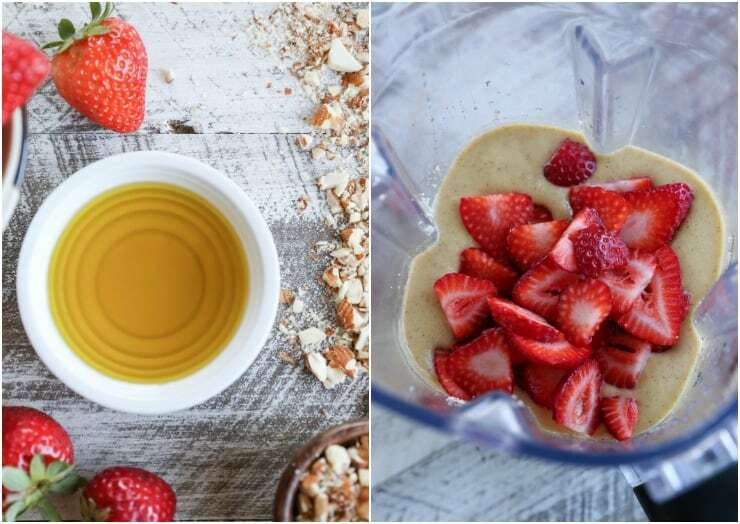 Add all ingredients for the cake except for the strawberries and raw almonds to a blender and blend until smooth. Fold the sliced strawberries into the cake batter. Transfer the batter to the prepared pan and smooth into an even layer. Top with the raw chopped walnuts. Bake on the center rack of the oven 45 to 55 minutes, or until the cake turns golden-brown and the center is set up. Turn off the oven and allow cake to stand in the hot oven another 10 minutes. Allow cake to cool at least 1 hour before slicing and serving. I remember seeing all the olive oil cake recipes and every time I did I thought I need to try baking with olive oil! Somehow I haven’t gotten around to it but I’ve tried my fare share of baked goodies and they’ve always been amazing. This cake looks so moist and delicious and bonus points that it’s healthier! haha yeahhh they are so still at thing at my house!! Over the last year or so I’ve really been baking more with olive oil and I cannot get enough of it! This cake has my name written allll over it! Yeeeeah, get on it, girl! You’ll love it! Any way to do this without eggs? You can try to use a vegan egg replacer like this one from Bob’s Red Mill. Quite honestly, I haven’t had much luck with flax eggs or chia eggs in cake recipes, but I think the egg replacer would work marvelously. You could also try applesauce or banana, but both will likely effect the flavor of the cake. Let me know what you end up trying! The third bullet point says walnuts. 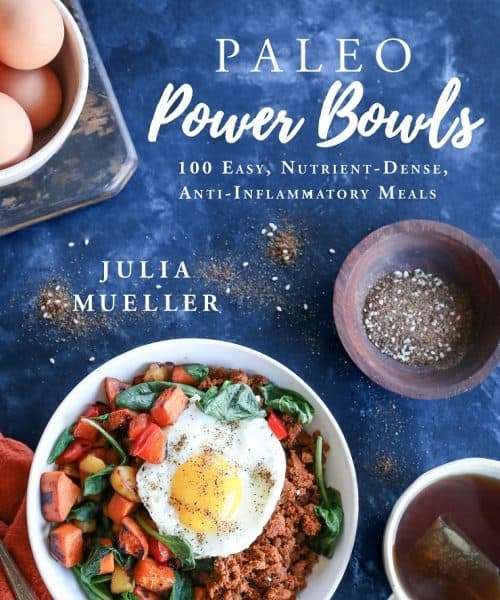 Assume this refers to the almonds? A friend made and this was delicious— thanks for sharing.